A Wisconsin middle school student has been banned from wearing a traditional Native American medicine pouch. 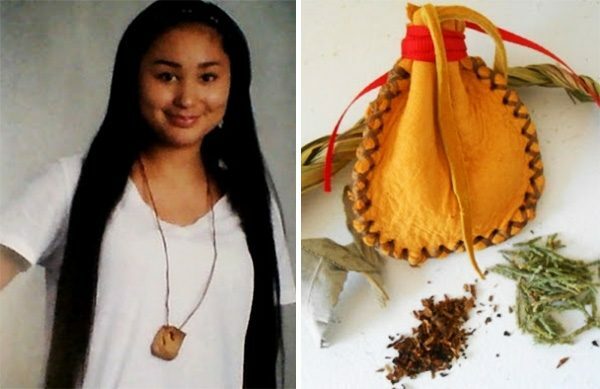 The 13-year-old Menominee student was forced by her school principal to remove the medicine pouch, which was constructed and filled with traditional symbolic indigenous plants. It all happened back on October 21. That’s when Rosella “Rose” Kaquatosh was pulled from the lunch line at her school for wearing the pouch outside of her clothing. A kitchen employee at the Gresham Middle School was the first to demand that Kaquatosh remove the pouch. “She saw her pouch [and] she started hollering at her, saying ‘take it off!’” Kaquatosh’s grandmother, Karen Gardner, told ICTMN. Kaquatosh tried to explain to the paranoid school officials that the tobacco leaf within the pouch was sacred, and was not for recreational use – nor was it in a form that could be chewed or smoked for such use. Gardner said that she was ordered to tuck the pouch away, which indicated the problem was not with the contents of the pouch, but by her pride in her Native culture being on display. Later, the school principal forced her to remove the pouch entirely. Members of the local Native American community in the Gresham area attended a school board meeting about the school abuse of power and suppression of Native culture. All that Rosella “Rose” Kaquatosh and her family want is an apology. “They didn’t say they would send any,” she explained. The post School Forces Native American Girl To Remove Medicine Pouch appeared first on Counter Current News.